There are very few species on earth that reproduce as quickly as cockroaches. A female roach can lay up to 50 eggs at a time and can lay almost a 1000 in its lifetime. Each one of these eggs can be reproducing within just a few months and can start the cycle over again. It is for this reason that it is critical to get these insects under control quickly as soon as you see them. 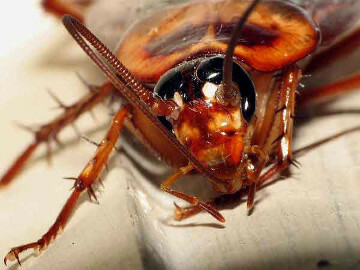 Cockroaches will always nest and congregate in a place of the home that is warm and close to their food source. This will almost always be in your kitchen. They love to get under the refrigerator or behind the oven for their warmth and they can find a lot of food sources around these places as well. How they got into your home may remain a mystery, but it is likely that they were brought there from food that you brought into the home. If you live in an apartment or duplex, your shared wall neighbors may have brought them to you. Regardless of how they got there, there are a few important things that can be done to limit them from getting much worse. The first and most important thing that you can do is to do a deep cleaning of your kitchen. The idea here is to get rid of food sources. This could be obvious food dropped behind appliances or more subtle grease splatters around the stove. By cleaning these areas, you are limiting their available food, which will cut down on reproduction as well. Once you have done this, it is time to call in the big guns. By calling Bloom Pest Control, you are going to get a professional, licensed technician. We use the most advanced products available that are safe and extremely effective. Got Nasty Cockroaches in Your House or Business? Our professional pest control technicians excel at ridding your home or business of cockroaches. Give us a call or use the handy online form below to get started on the road to pet and family friendly cockroach extermination.